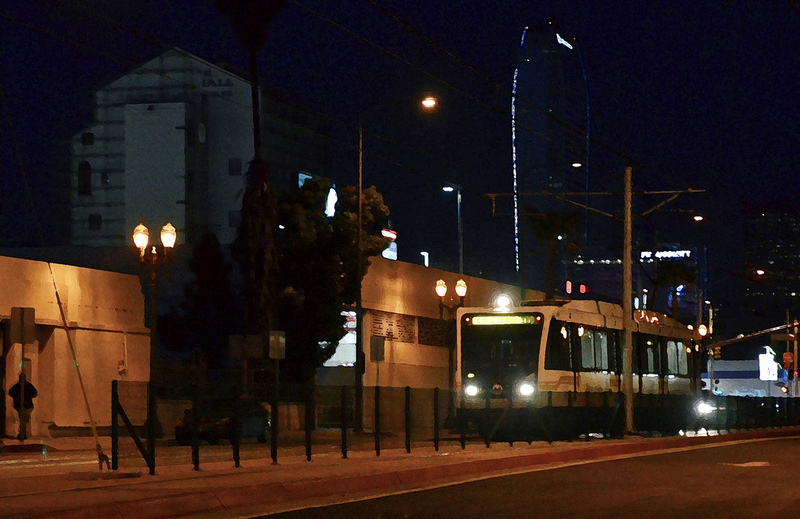 A photo illustration of the Expo Line at night on Flower Street. By Steve Hymon/Metro. Good news: Beginning this Sunday night, the Gold and Expo lines will be running an enhanced late night schedule. Both lines will run every 10 minutes until midnight instead of every 20 minutes. This will be accomplished using shorter but more frequent trains. Customers should board the trains toward the front of the platform. In addition, the Orange Line will run every 15 minutes until 11 p.m. and then every 20 minutes until close. There is one big exception to the 10 minute service on the Gold and Expo lines. On nights when late night maintenance is scheduled, trains will run less frequently, usually every 20 minutes. Customers should check http://bit.ly/servadv to view Planned Service Advisories and/or follow Metro’s Service Alert feed on Twitter. I still think it’s a waste of money though, and on the Red Line with all the tunnel washing going on Sunday-Thursday, it drops nighttime frequencies on the Downtown segment from 5 to 20. Fifteen minute service until midnight on all colored lines, including Silver and Green, would be a lot more cost effective. Even better would be to take some of the 24 hour bus routes than run hourly after 8 pm (!!!) and have them run half hourly until midnight, which would provide connections to more parts of the county. What about the green line? No changes for the Green Line at this time. So the gold line will run 1 car trains instead of two car and run more often? This is a baby step in the right direction, but ask yourselves honestly – is it really good enough? How a major city like Los Angeles doesn’t have more accommodating rail lines that run more frequently throughout the night, all night, is simply baffling. It’s a money issue. While there are a lot of people who say they want all night service, the fact remains that ridership can be on the light side, especially when compared to service the other 20 hours of the day. That said, I think having such a mobility safety net is something many people — obviously including yourself — have indicated they want. And I believe Mayor-elect Garcetti in his recent reddit conversation indicated he’s interested in more late night service. So we’ll see — it’s certainly an issue worth keeping an eye on. Are there any publicly available statistics on Metro rail ridership by time of day? It seems to me that the Green Line, which has equal or greater ridership than the Gold Line or Expo Line (http://www.metro.net/news/ridership-statistics/) is a far better candidate for more frequent late night service (and more frequent Saturday daytime service). Taking it at night on a weekday when it is running every 15-17 minutes, the line can get packed; plus, it’s no fun waiting for a train for nearly 20 minutes. I agree Brian. While a lot of people like rail service the fact is that buses cover more ground and can provide benefit to more people. Studies have generally shown that 15 minutes is the threshold for people to consider service so frequent enough that no schedule is required. This is evident by Metro’s own 15 minute map. I doubt that a lot of people are complainig about the difference between 10 and 15 minute service. So it is disappointing when bus lines that show up on the 15 minute map, like the 76 (Valley Boulevard) and 108 (Slauson Avenue), drop off to hourly as early as 7 pm. More people would be willing to use the bus in these areas if more night service was added on existing frequent service lines, to at least every 30 minutes until 11 pm, and save the money by only running four trains an hour instead of six as is present (which will also hopefully eliminate the need for maintenance to cut service to every 20 minutes so frequently). How unfortunate that the Red and Green lines required drivers, when they didn’t have to. In agreement with Brian and Calwatch, I find this increase questionable in terms of being a wise use of valuable labor time. I used to ride the Expo Line from Downtown LA to Culver City every weekday at about 5:30pm and perhaps once out of dozens of times riding it at that time did I ever have to stand even for a little bit of time. I think the extra runs would be more useful for a litany of alternatives, e.g., at least hourly service all night long every night, more buses on lines like the 720 where I have regularly had to stand and/or be pushed up against other riders, etc. Has anyone or even Metro considered going into business to open up a restaurant/rest area/diner/etc. that’s open in the opposite hours of 8PM to 8AM to accomodate the needs of said passengers? I went on many business trips to Japan and you’d all be surprised that trains do not operate 24 hours over there. Last train ends around midnight and there is this dead zone until 4 AM which during that time is when the janitors and maintenance crew takes over to keep the stations and trains clean and safe. During those 4 hours of dead zone, many business propped up near the stations to cater for the needs of stranded passengers. 24 hour internet cafes, comic book cafes, karaoke, restaurants, diners, bath houses, mini capsule hotels, 24 hour convenience stores, you name it. I mean it has to make sense. Rather than risk spending millions of dollars on trying to accomodate the needs of very low amount of riders for late night service, might as well just open up a shop or restaurant that’s open from 8PM to 8AM and make money that way. Missed the train at midnight, pay $5 to rent a shower and stay there until the morning train comes along. Pay $3.00 for a coffee and stay there until the morning train comes along. Fred: I believe the subway (purple and red) can be run on full automation (from day one of service), but like BART, a person is in the cab, nonetheless. Some years ago, I know that subway operators were to operate the trains 30 percent of the time, and then “babysit” (like BART) when the trains run in automation. As for the Green line: it was originally designed to be a true driver-less line. Meaning not just capable of full automation (like red and purple), but with NO driver at all with speeds up to 80MPH. However, the economy tanked in the 1990’s, and this big “buy American” bug hit, inferring that we should not buy anything from foreign companies because of the poor economy. By coincidence, the City of Los Angeles was scheduled to vote to approve it’s share of funding for the Green Line, the last financial link to fund the line. Several council member, including the late John Ferraro, argued fervently like they should not be paying “that Japanese company” to build the automated system and provide the Japanese rail cars for it and that “Morrison Knudsen builds dams; they ought to be able to build the Green Line.” The same Morrison Knudsen who later delivered brand new trains with cracked frames to CalTrans in Oakland. Unfortunately all this criticism of sending our business to foreign companies–who had the expertise for designing such systems–was interpreted as racist “Japan Bashing” by other participants. I was there at City Hall that strange day, and the local news did a good job of summing things up, as LA City Council and other politicians who are usually so media savvy, were just trading barbs and saying unkind things to each other with then councilman Zev Yaroslavsky interrupting a news conference in one of the council’s press rooms with Zev telling the individual (I can’t recall precisely who he was but he was one of those obscure local politicians of a smaller city who often get a seat on the transit agencies), “NO, no. This is our press room, go somewhere else–” with the two arguing in front of the cameras. It was a surreal day with a circus mentality, but one which my reporter friends LOVED because the usually sophisticated LA politicians were losing it. Of course, Tom Bradly led the notion of the truly driver-less Green Line, and the Japanese firm that was to design it. Well, the whole driver-less component was killed, and we have the compromise of the Green line today, with us just purchasing the same cars as on the Blue line, again, a late change to the design. So, Fred, your point is spot on. One of the reasons a truly driver-less Green line was planned was the LOWER cost of operations that would also allow for more frequent and more LATE or overnight service on the line. This was an often cited benefit. So, yeah, Fred, you got it right.